For many centuries in Italy and around the world, the hearth of the home has been the center of everything. It is a place where families and friends gather, eat and drink, share stories and create memories. In the spirit of preserving that tradition, The Hearth is an online community available exclusively for A Tavola members. The Hearth grants exclusive access to a library of special recipes, stories, and culinary tips from Michael Chiarello. Check back often, and we'll let you know when there's something new! This dish embodies the contradictions of late winter in Northern California. The deep flavors of the roasted beets and onions contrast with the cool orange and fresh coriander. Add a cheese such as crottin (from goats) or pecorino (from sheep) since it's also the season of newborn kids and lambs. Preheat the oven to 400?F. Cut the stems and tails off the beets and trim both ends off the onions. Do not peel. 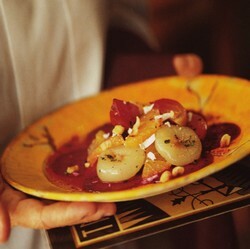 In a baking dish, toss the beets and onions with the olive oil and season with salt and pepper. Roast until tender, about 30 minutes for small beets, or about 1-1/2 hours for large beets, and 30 minutes for the onions. Arrange the hazelnuts in a small baking dish and place in the oven with the vegetables. Cook, shaking the pan occasionally, until the nuts are lightly browned and fragrant, about 20 minutes. Fold the nuts into a tea towel and let sit about 5 minutes, then rub them vigorously with the towel to loosen and remove the skins. Chop the nuts coarsely and reserve. As the vegetables are done, remove them to a plate, let cool, then peel. Depending on their size, cut the beets in half or into thin slices. Cut the onions in half lengthwise. In a medium bowl, combine the hazelnut oil, coriander, and orange juice. Whisk until well combined and season with salt and pepper. Peel and remove the membranes from the oranges with a sharp paring knife. Cut the oranges in half lengthwise, and then crosswise into thin slices. Seed the slices and add to the bowl containing the dressing. Add the onions and toss well. Divide the orange slices and onions among 4 plates. Scatter the beets around the oranges and onions and drizzle the salads with any juices left in the mixing bowl. Sprinkle some of the grated cheese over each salad, if desired, and sprinkle with the reserved nuts. Serve immediately. Serves four. I tend to overdress salads like these so you can soak up the dressing with a piece of crusty bread, and call it a meal. To view a printable version of this recipe, click here. Combine cinnamon, juniper, allspice and nutmeg in a cheesecloth bag and drop in a saucepan with a quarter of the wine. Add the sugar and orange peel. Simmer to blend flavors, about 6 minutes. Add the remaining wine and return to a simmer. Remove spice bag and orange peel and serve. Makes six servings. If transporting in a thermos, fill the thermos up with hot water to get it hot, about one minute, then fill with mulled wine. 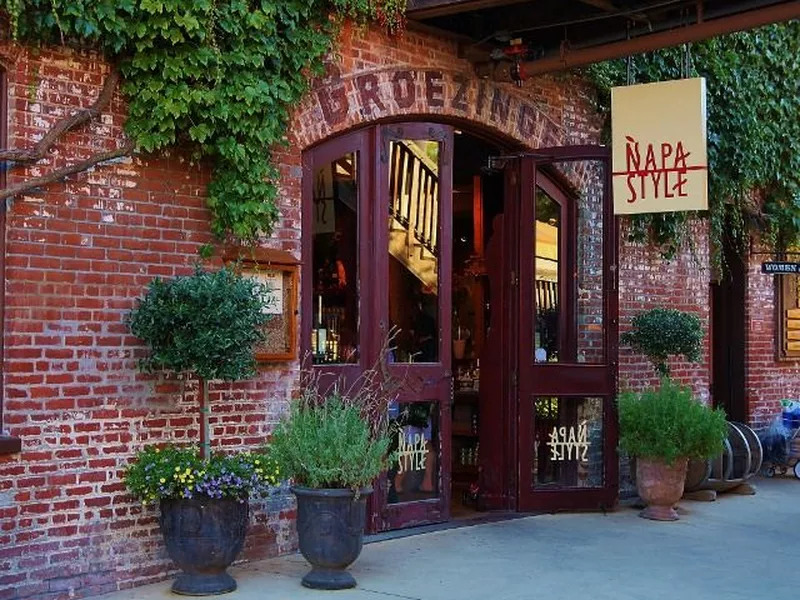 If you haven't heard our exciting news yet, check out this article (link below) from SF Eater on our flagship NapaStyle store's remodel and rebranding in 2016. Chiarello Family Vineyards will also be changing: in early 2016 we are opening a new private tasting room located next door to Bottega inside the V Marketplace shopping center. Stay tuned! Have you ever wondered about the little glass-like crystals clinging to the cork or collecting at the bottom of a bottle of wine? These “wine diamonds” are called tartrate crystals, natural particulates that form during and after the winemaking process when the wine drops to a cold temperature. The crystals form when two naturally occurring elements found in wine, tartaric acid and potassium meet under cold temperatures and bind together to form potassium bitartrate, which is essentially a salt. This is why you might find that crystals form in a white wine once you put it in the refrigerator. 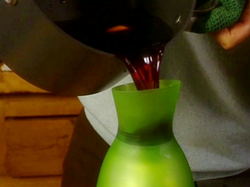 Wines are often clarified and stabilized before bottling to remove small particles of yeast, tannin, and other grape matter prior to bottling. Among these processes are filtering, fining and cold stabilization (essentially refrigerating the wine) to help clarify the wine prior to bottling. These processes help prevent the formation of tartrate crystals, which form when the correct elements and cold temperatures are present together in the wine. Because we do not clarify our wines prior to bottling, it is common to see tartrate crystals form in our Chiara Bianco and Chiara Rosé of Zinfandel, especially once you put it in the refrigerator. The most important thing to know: they are harmless! Tartrate crystals have no impact on the flavor or quality of the wine. By not filtering or fining our wine before bottling, the result is a more aromatic, textured wine that has weight and a beautiful finish. It is wonderfully child-like to eat a cupcake. Make that cupcake out of a flourless chocolate cake batter and they grow up to be just plain wonderful. Arrange on a two-tiered dessert stand and dust the entire pyramid with powdered sugar. These are perfect to serve at a buffet dinner, as you need no plate, simply a napkin to catch the drop of oozing chocolate running down your chin. Preheat the oven to 300 degree F.
Preheat cupcake pan in a 300 degree F oven on baking sheets for about 5 minutes. Lightly grease a muffin pan with room for 12 muffins (each mold should hold about 1/3 cup). Dust each mold with cocoa. Combine the butter and cream in small saucepan over medium-high heat. Thinly shave 5 ounces of the chocolate with a large knife and put the chocolate in a medium bowl. When the cream mixture comes to a simmer, pour it over the chocolate and mix gently to incorporate the ingredients. In a medium bowl, whisk together the eggs, sugar, mayonnaise, cornstarch, cinnamon and salt just until the sugar has dissolved. Pour the chocolate mixture into the egg mixture and gently mix just until the homogeneous. Mixing too much will prevent the eggs from rising in the oven. Scoop about 1/4 cup of the batter into each mold (about 3/4 of the way up the sides). Bake just until a toothpick inserted in the center comes out clean, 40 to 45 minutes. While hot, add a chunk of remaining 3 ounces of chocolate in the center of each, by gently pushing it through the top of the cupcake in the center. Cool the pan on a rack for 10 minutes and then unmold them. Serve warm on a pedestal or platter, stacked two-high if possible in pyramid form. Dust with powdered sugar and serve. 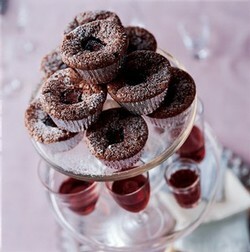 This is one of the few desserts I love with red wine, a very ripe Zinfandel - great with our Giana Zinfandel! Be certain to add the chocolate chunk into the cake while still quite hot from the oven otherwise the crust will form and you will damage the appearance. The mayonnaise is here to add moisture to the cake. You could omit it with out adjusting the recipe but it has an amazing effect. We are so often asked what are our favorite restaurants, wineries and things to do in Napa Valley. Here, Michael shares his favorite picks for a perfect day in his hometown. Read the article here.